Explanation: Triggered by the impact of a coronal mass ejection on New Year's eve, a moderate geomagnetic storm brought a celebration of sky lights to planet Earth's high latitudes yesterday. 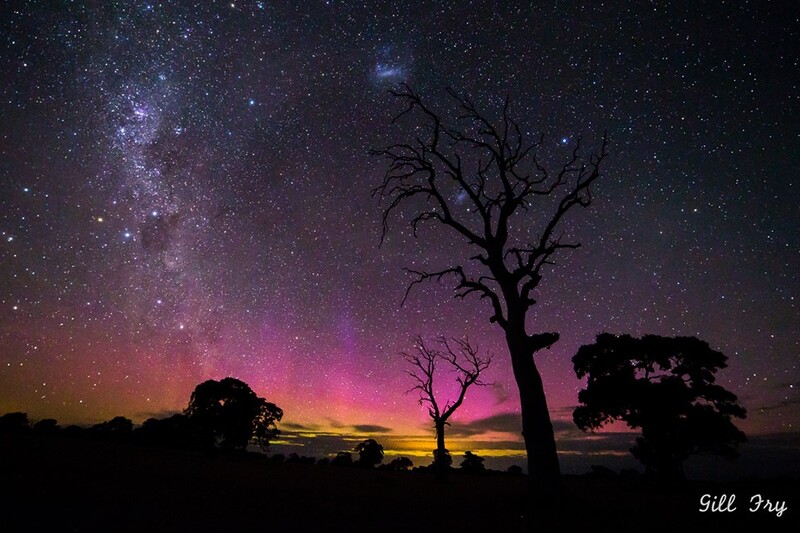 In this New Year's nightscape, the shimmering reddish curtains of aurora australis along a southern horizon are captured over Morgiana, SW Victoria, Australia. Of course, more permanent jewels of the southern skies are on the scene. The southern Milky Way, Alpha and Beta Centauri, and bright stars of the Southern Cross are on the left. In silhouette, branches of the large foreground tree stretch across the Milky Way's satellite galaxies, the Large and Small Magellanic clouds. The bright star framed near the tips of tree branches at right is Achernar. Alpha star of the constellation Eridanus, Achernar is sometimes known as the southern end of the river.